Very amusing for me, very good for you - and profitable, too, very likely, if you ever get over it. The very best thing I can think to say about The Hobbit: An Unexpected Journey is this: it has left me with absolutely no reason to assume that 2013's The Hobbit: The Desolation of Smaug is going to be half as much of a slog. If nothing else, that sequel's title, in relation to the content of J.R.R. Tolkien's 1937 novel, promises that the film shall have a great deal of something that An Unexpected Journey rather disappointingly lacks: content. And if we could marry the flash-and-dazzle popcorn adventure theatrics of An Unexpected Journey to honest-to-God content, well heck, we'd have a movie right there. 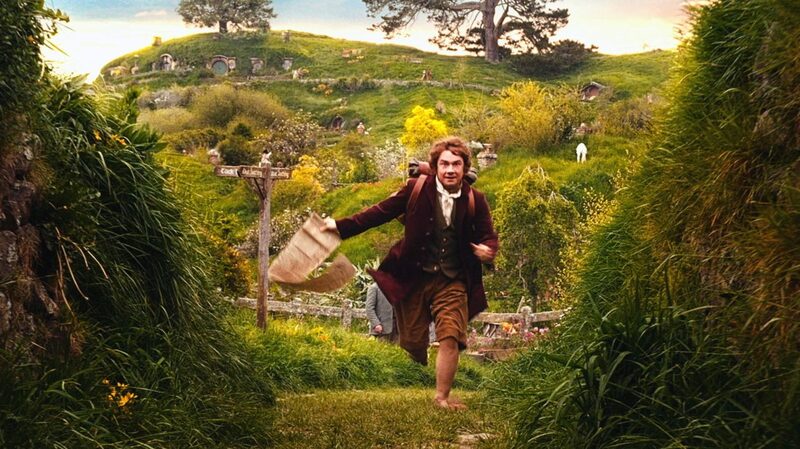 I am, of course, being snitty: there is plenty of stuff in An Unexpected Journey. It's damn well full of stuff, in fact, stuff all the way up to a bloated 169-minute running time. But stuff is not exactly the same thing as having a rich and complicated plot, or at the very least a panoply of events. Upon learning that producer, director, and co-writer Peter Jackson, in concert with fellow writers Philippa Boyens & Fran Welsh (and a credit for Guillermo del Toro that smacks of being a bit more of a contractual thing than an actual sign of his involvement), had decided to turn a 310-page children's book into a film trilogy augmented by the material from the appendices at the end of The Lord of the Rings, it was easy to assume that the new films were going to be so overburdened with the epic machinations of Great Men, hidden in the background of The Hobbit or missing altogether, would form a huge bulk of the trilogy's plot, overwhelming the simple little story of a homebody who was thrust on an adventure and found that he thrived there. This is not the case: other than a lengthy scene right in the middle, almost everything in An Unexpected Journey is taken from the first third of the book, a book extremely light on detail, especially in that selfsame first third, and depicted in exacting detail; or, when necessary, the writers take a paragraph of general description or even just a sentence glossing over a story development, and use it as the crux for a scene. It is a film in which you can very nearly see the sweat as it struggles to invent things to happen, and the sense one gets isn't that An Unexpected Journey is 169 minutes because Jackson couldn't figure out how to shorten it any more, but because he was goddamn well not going to release a Tolkien adaptation that came in under two and three-quarter hours. In a way, this is soothing: one recalls the last time Jackson and company opened up a fantasy trilogy in 2001, with The Lord of the Rings: The Fellowship of the Ring, that movie was hectic and frenzied in its attempt to cram an incident-heavy plot - the busiest of any individual volume of The Lord of the Rings - into just a bit under three hours. For An Unexpected Journey to instead take its time to linger over its sets and its plot points and characters isn't actually a sin, then. Except insofar as those things aren't, by and large, all that interesting: the design of the world has a definite "been there, done that" feeling to it, and while I imagine the trilogy's faithful legion would have every reason to be ecstatic to see good ol' Bag End and good ol' Rivendell again, the new film's insistence on the familiar and the domestic makes it feel less like a movie in its own right, more like a tribute to how proud the filmmakers are of the original trilogy, and want to remind you of it (certainly the length of time spent at just these two recurring locations - by far the longest pauses in the journey of the title - adds to this impression). As for the characters, the script does its best to differentiate the 15 principals, but even with only nine and more time to explore them individually, The Fellowship of the Ring still left a couple members of the titular group feeling painfully undernourished, and An Unexpected Journey has a mostly undifferentiated mass of dwarves, of whom at most four emerge from the general mass, and two of them more for their physical characteristics (Fat One and One With Pointy Hair) as for their personalities. That leaves the film feeling more like a solo affair than an ensemble piece: and luckily, in the form of Martin Freeman as the titular hobbit, Bilbo Baggins (played by Ian Holm in the original films, and in story-opening cameo here), An Unexpected Journey has a tremendously effective lead performance: quite possibly the best job of casting anywhere in the whole franchise, and a performance at the level of even the very best of the originals' packed casts - and since the best actors in those movies reprise their characters here, Ian McKellen as the twinkling, mysterious wizard Gandalf the Grey, and Andy Serkis as the motion-captured cave creature Gollum, it's easy to compare Freeman to them directly. Freeman's Bilbo hits all of the right notes: easily flustered, easily offended, but also enough of a closeted romantic that he secretly enjoys himself too much to be genuinely afraid of the perilous situations that confront him. If only the film surrounding Freeman matched his nimble, fun, unfussy performance! But it is not, except in patches: the film has the good fortune to open and close with its best sequences, a myth-tinged retelling of how the great dwarf kingdom at Erebor was crushed by the thieving dragon Smaug, and a revisit with Gollum in a note-perfect dramatic version of "Riddles in the Dark", the most famous and beloved passage in all of Tolkien's writing, that finds Serkis actually better than his already best-in-show work in The Two Towers and The Return of the King; followed by a battle scene that is much the best of the film's action setpieces. And this sandwich helps to make the movie a bit more palatable. But everything in between these end points is generally stiff, uninspiring, bland fantasy filmmaking: a leaden scene with old Bilbo and his nephew Frodo (Elijah Wood) that retells, in excruciating detail, what happened in the 10 minutes before The Fellowship of the Ring opened, mostly to add recurring names to the cast list; far too much business with far too many unspecific dwarves before the plot actually asserts itself, and they and Bilbo and Gandalf all go journeying through fairly unspecific locations (though as always, the New Zealand scenery is glorious), while having clumsily-staged fights along the way - until the end, there's not a single action sequence that I can get behind, with one (the characters caught in the midst of a fight between giant stone monsters) that is a complete failure of editing and visual effects compositing, and one (a chase through a subterranean city of goblins) that looks in every way more like the cutscenes from a video game based on the movie than the movie itself. Good things crop up every now and then: the design of the Goblin King (Barry Humphries) is pleasingly yucky (and his aide-de-camp is a dead ringer for the zombie baby in Jackson's wonderful Braindead, AKA Dead Alive), and a LOTR reunion between McKellen, Cate Blanchett, Hugo Weaving, and Christopher Lee is fun until it becomes obvious how much their scene together is interfering with the little bit of narrative momentum that has managed to accrue. The CGI is pretty terrific throughout, and the new technology used for Gollum results in a subtler and more refined visual depiction of that character than before. In general, the film's evocation of the lighter, children's story tone of the book works fairly well - there's even a musical number that works pretty well - though Jackson's attempt to marry the book's silliness with the seriousness of his own LOTR movies (this is as violent a movie as any of them) works very poorly - there are moments where McKellen looks genuinely wretched at having to square the things he's saying with the character he has already established - and not even the book's light tone can justify the extraneous depiction of comic relief wizard Radagast (Sylvester McCoy), with his moss-covered face and rabbit-drawn sled, and his garish bumbling even in the face of the film's one truly dark and grim location (which already looks like a carbon copy of a location from Fellowship). Basically, the film is unfocused and stretched-out, and the good things seem almost as arbitrary and accidental as the bad things. But the Howard Shore music booms out effectively - I frankly liked it better than any of his LOTR scores - and the sense of scale in the mise en scène is there, even if it's not in the narrative yet (the final scene almost thumbs its nose at how "little" An Unexpected Journey has been, in light of where it still has to go), and Freeman is amazing. And look at what we have coming in December, 2013: spiders, barrel-riding, dragons, and were-bears. Surely there has to be something effervescent and exciting in all of that, and I look forward to regarding the current picture as "the set-up movie" instead of "the boring movie".